The Index opened negative around 8303 and went onto touch the lows of 8278 within the first few minutes but saw value buying to prop the index above 8300 to close just in red at 8334.60, loss of 4.75 points. The broader market was also weak, with 656 advances to 825 declines. 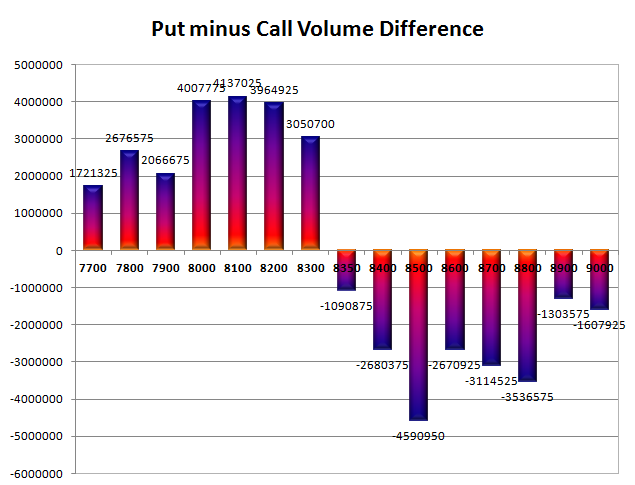 Range as per Option Table till expiry is at 8100-8500. Call option 8300-8350 added 7.23 lacs OI with profit booking seen at 8400 and above strike prices. Put option 8350-8100 added 6.64 lacs OI with short covering seen at 8400 and above strike prices. Nifty Open Interest is at 86,01,350 down by 21,49,400, whereas June series added 36.01 lacs with decrease in price, most probably 100% rollover with huge short build-up. Bank Nifty Open Interest is at 13,04,575 down by 1,78,475, whereas June series added 2.42 lacs with increase in price, most probably 100% rollover with long build-up. 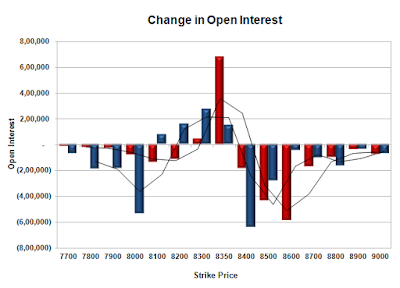 FII’s sold 1.78 lacs Futures, which includes 29640 contracts long build-up and 36775 contracts short build-up, with increase in net OI by 66415 contracts (includes 307019 longs to 314154 shorts for the day) and the Average Price comes to 8833.71. FII’s Index future open contract as on date is 399776 Longs to 385158 Shorts, Net Long 14618 contracts. Initial and best support still at 8300, with OI of 52.22 lacs and below that at 8200 with OI of 48.97 lacs. 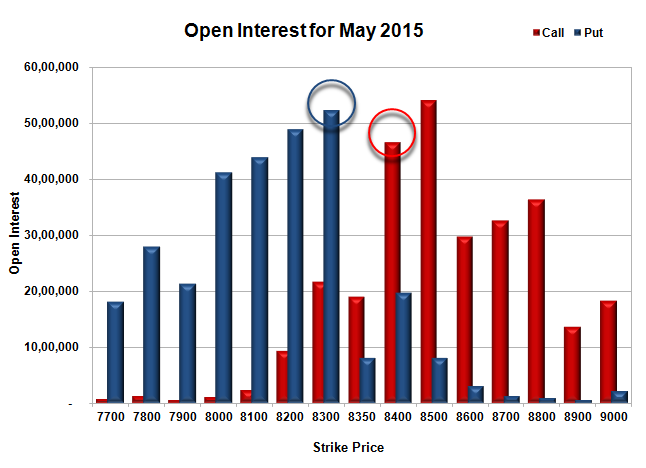 Initial resistance at 8400, with OI of 46.51 lacs and above that at 8500 with highest OI of 54.08 lacs. Day Range as per Option Table is 8256 - 8389 and as per VIX is 8259 - 8410 with 8318 as the Pivot.